Hello hello! 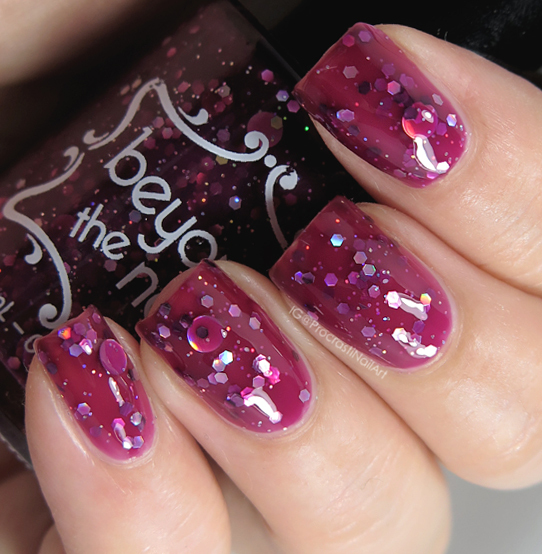 I have a couple holiday polishes to share with you today with one of my favourite Canadian indies - Beyond the Nail! 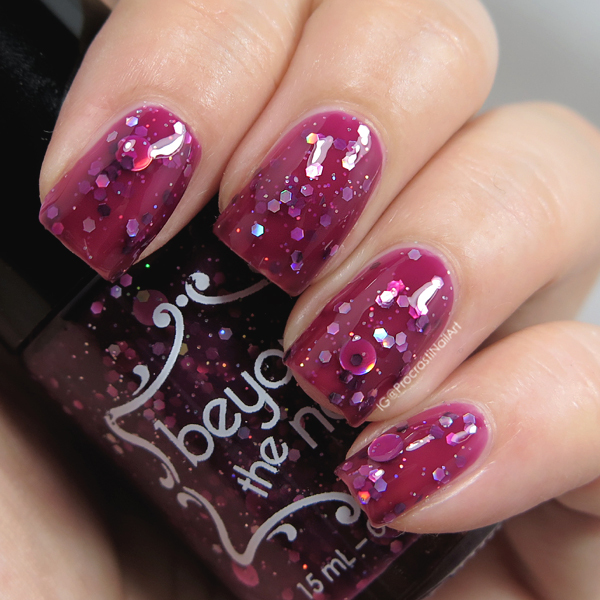 These are two of the four shades released in the 2016 Winter Holiday Collection - Cranberry Jelly and Wreath. I've reviewed a couple of their polishes before but these were my first glitter jellies and I was really impressed! Sometimes jelly polishes can get a bit gloopy but these applied with no issue. Check under the cut for a better look! Since it's a jelly polish it took me three coats to build up the opacity but the glitter was distributed generously throughout the polish so I had zero issues with getting an even layer of it. The circle glitter I did have to fish for a bit but that's to be expected with an accent glitter. I used one thick layer of top coat to smooth it all down. The second polish I have is Wreath - a festive green jelly packed with green microglitter and larger red, green, gold and purple glitter. It took three coats to build up the opacity and I finished it all with a layer of top coat to smooth things down. 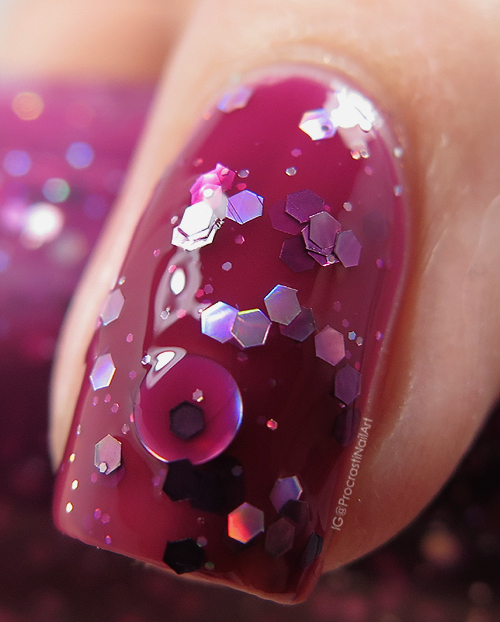 This is the perfect shade for Christmas, and I've already used it once for nail art! I'm really glad I picked up both these shades and they've already had a lot of wear for me! I'm wearing Cranberry Jelly on my Cinderella hand right now, and every time I sit down to do Christmas nail art I look at Wreath. 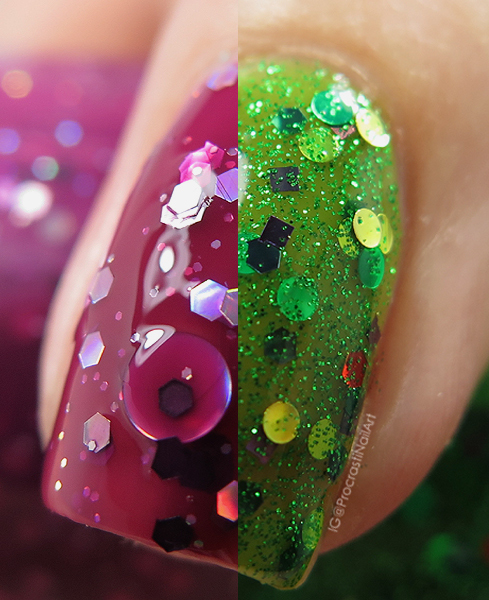 If you're looking for some fun and seasonal shades you should def check these two out! Let me know which polish is your favourite, and if you have any nail art ideas I could pull together with these two lovelies let me know! That Cranberry Jelly makes me weak in the knees!! Both of them look nice. Oooh that jelly! So squishy! They're such awesome happy shades! And oh, the big holo circles, oh! Love!